Soo Line on Tax Day! Soo Line on Tax Day! A Soo Line SD40-2 leads an eastward CP Rail freight near Dalton, New York on 15 April 2004. Exposed on Fujichrome using a Contax G2 with 45mm Zeiss lens. The old Erie Railroad is one of my favorite lines. Mike Gardner and I got a very early start on 15 April 2004. We worked our way west to the Portage Bridge at the Letchworth Gorge in western New York State in time to intercept an eastward CP Rail freight. We chased this capturing it in multiple locations along the old Erie line to Hornell. At this time Norfolk Southern was the owner operator, while CP Rail operated via Delaware & Hudson trackage rights. Clear blue dome; bright red EMDs, and great scenery with a good quality chase road made the morning extra productive. Amtrak 63, Ivison Road, South Byron, New York, May 6, 1989. It was 2:48pm, when I made this image of Amtrak train 63, the Maple Leaf approaching Ivison Road—named for the Ivison farm at the center of the photograph. Exposed on Kodak Plus X using a Leica M3 with 50mm Summicron lens, f5.6 1/250th of a second. Exposure calculated with the aid of a Sekonic Studio Deluxe hand-held photo cell. 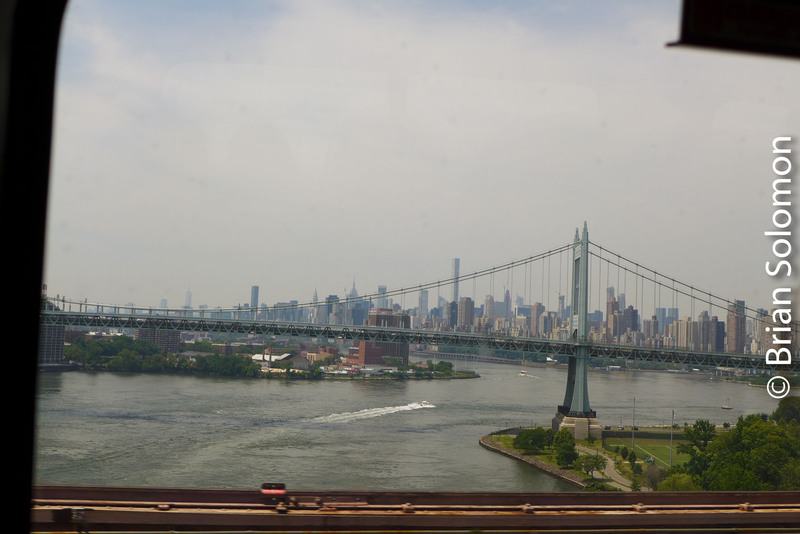 I’ve allowed the road to occupy the dominant portion of the frame; yet the train remains the subject. 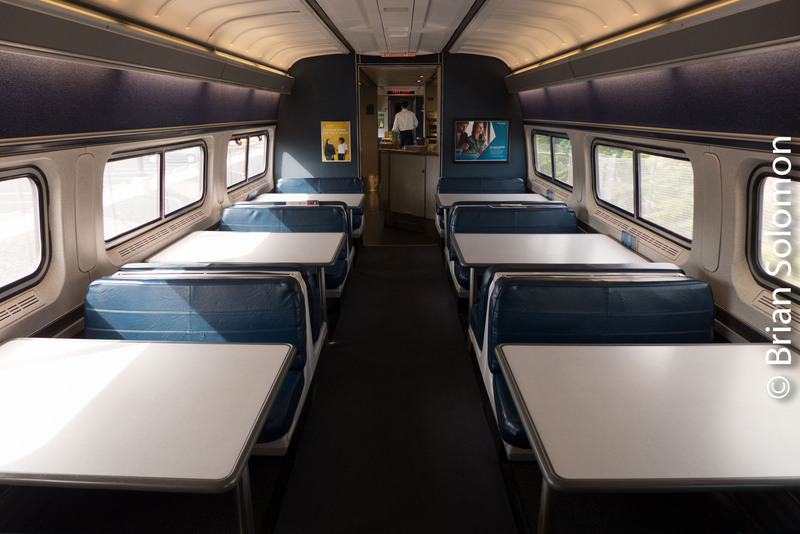 At the time, an Amtrak F40PH with Amfleet was just about as ordinary as it got and I wanted to put the train in its environment to make for a more interesting image. Tracking the Light looks at Pennsylvania Station, New York—five photos. On June 25, 2015, I made these photographs at New York’s Penn Station. 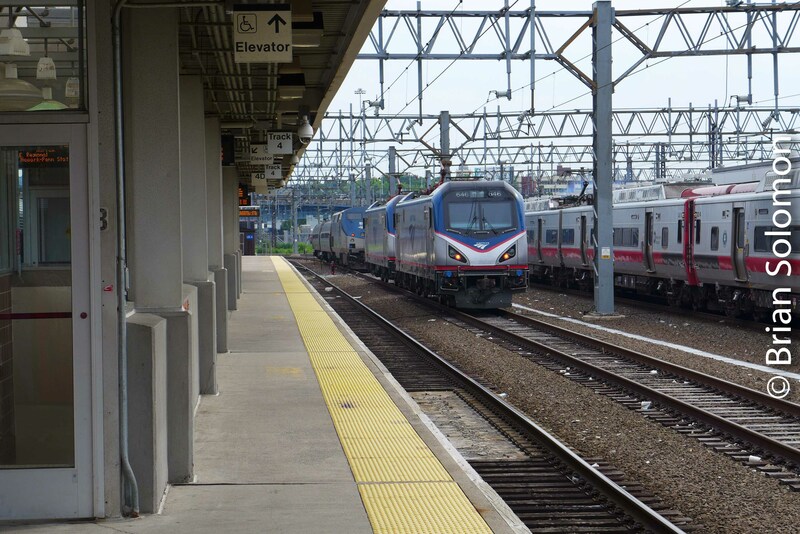 This is Amtrak’s busiest station, and a terminal for Long Island Railroad and NJ Transit suburban trains. Once it was one of the world’s most elegant railway terminals, built in a style inspired by the Roman baths of Caracalla; but today Penn Station is mostly functional, with little in the way of elegance to inspire the traveler. However, good and interesting photographs should not rely on great architecture as a crutch to draw the eye of the viewer, right? Tracks, wires, iron girders and fluorescent light. A large black & white photo may remind passengers of the age of elegance. Yes, Virginia, we are standing in the same place. 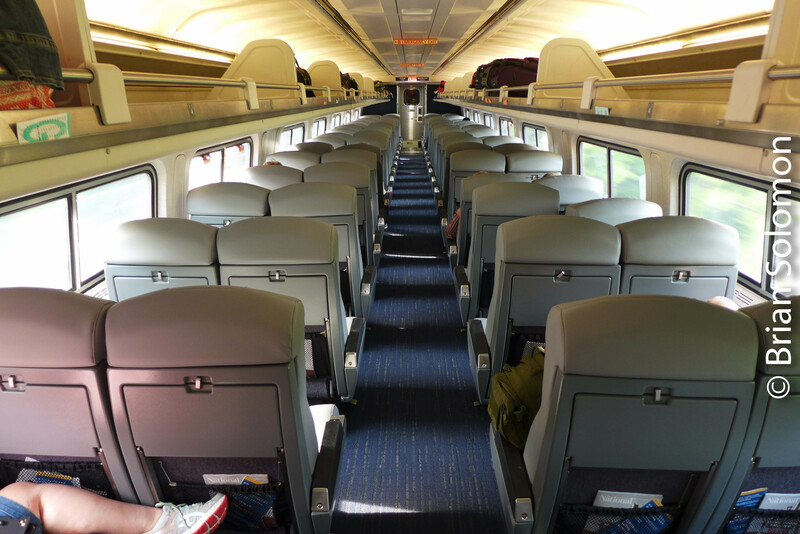 On the plus side, all Amtrak trains were running to schedule. Really! Penn Station allows direct connections between various railway services. Onward to the Long Island Railroad! Photos exposed with a Panasonic Lumix LX7 digital camera. Western New York in the 1980s. Should I head to the mainline (Conrail’s water level route) or explore branch lines? Do I stick with Conrail or seek out a short line? These were among the quandaries facing my photographic choices when I had some time off from college. As a photography student at the Rochester Institute of Technology, I had a full schedule of classes, labs, and projects. I was a ‘work-study’ student, which implied I had to spend about 25-30 hours a week toiling for peanuts on top of classes, assignments & etc. My point is that I had very little free time, and rarely a full day off, and so when I made time to make railway photos, there were tough choices (like mainline versus branchline; Conrail versus those other outfits). Now and again I’d cheat. (I don’t mean on exams). A bright sunny day? Now who will miss me in class? October 26, 1987 was a clear and bright day. Conrail’s WBRO-15 had 37 cars for the Livonia, Avon & Lakeville. I didn’t go to class. Kodachrome 25 exposed at Avon using my Leica M2 with 50mm lens. Often I’d head to the mainline. My time was short and I wanted results, and Conrail rarely disappointed. Sometimes I’d select a known good spot, and work through my exhaustive reading list while waiting for a headlight to appear. Other times, when the sun was out, I’d take a more aggressive approach and select my locations purely based on photographic merit and move from place to place as suited the action and the light. On January 8, 1989, a rare Conrail C30-7 (one of only ten on the roster) leads a westward empty coal train through Rochester, New York. I exposed a sequence of photos using my Leica M2 with a 200mm Telyt fitted to a Visoflex. In retrospect that was a bizarre and awkward camera-lens combination for making moving train photos. But I used it all the time with great results. A thin layer of high cloud softened the sun. The Curse of the Code Lines. In the 1980s, I often bemoaned the ‘telegraph wires’ as I called the code lines that lined most mainlines. Conrail’s fomer New York Central main line at Churchville, New York on April 10, 1987. The infamous code lines were lurking on the south side of the tracks. Exposed on Kodachrome 25. It seemed like more often than not, railroads placed these multiple-tier code lines on the south side of their mainlines. This inevitably interfered with my photography and plenty of otherwise good photographic locations were fouled by the rows of poles and the wires between them. 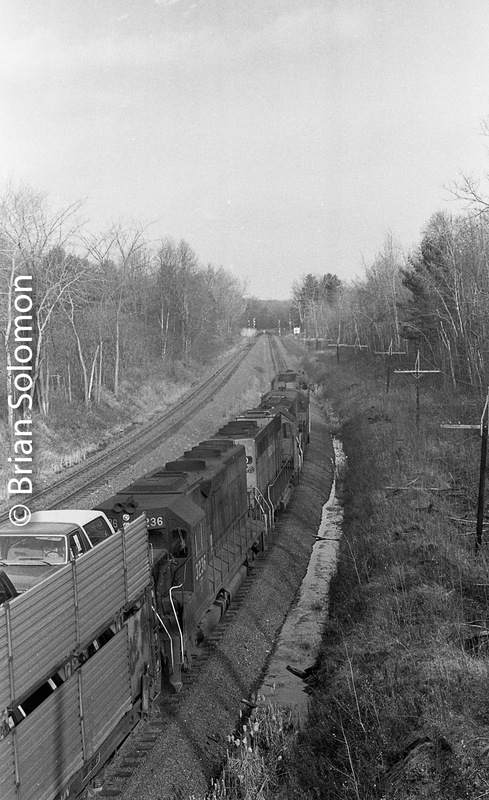 In early 1989, when Conrail was cutting down the old code lines east of Buffalo. I thought, Hurray! Good riddance! However, I quickly realized how wrong I’d been. In fact I’d been photographing the wires for years. On the afternoon of February 25, 1987, at Churchville, New York I exposed this Kodachrome 25 color slide using my college roommates’s Canon A1 with 50mm lens; f4.5 1/250th of a second. The poles and wires were my primary subject, the westward Conrail intermodal train was included for incidental interest. Yes, the code lines made for a visual challenge. And, undoubtedly these sometimes got in the way. But they were part of the railroad. Traditionally, they were key to its operations and often serving as a crucial part of the signaling system. They had been there since the steam era. After all, the railroad was more than just locomotives rolling along at speed. It occurred to me how I’d often improved my photographs by working with the wires. The visual elements and patterns added by the army of time-worn polls connected by rows of cables made for more compelling images. Conrail C30-7A 6593 leads symbol freight PXSE -9 eastbound at mp397 South Byron, New York. Exposed on K25 using a Leica M2 with 50mm Summicron. ‘Full sun setting’-240 foot candles according to my Sekonic Studio Deluxe. Camera set at: f4.5 1/250th of a second. Here’s I’ve worked with the code line, using it to frame up the passing freight. Sunrise at Donahue Road in Batavia, New York finds PXSE rolling east and SENF (Selkirk-Niagara Falls) roaring west. For me the code lines and morning glint light made this a favorite sequence. Exposed on PKL (Kodachrome 200) using a Leica M3 fitted to a Visoflex with 200mm Telyt lens mounted on a tripod. f6.3 1/250th of a second. Sunrise at Donahue Road in Batavia, New York with SENF (Selkirk-Niagara Falls) roaring west. Exposed on PKL (Kodachrome 200) using a Leica M3 fitted to a Visoflex with 200mm Telyt lens at f8 1/250th of a second. After the code lines were gone, the brush started to grow. And that’s now a much worse photo-hazard than the wires ever were. November Snow, New York’s Southern Tier. It had hardly snowed at all in Rochester when I departed before dawn in my 1973 Plymouth Scamp. 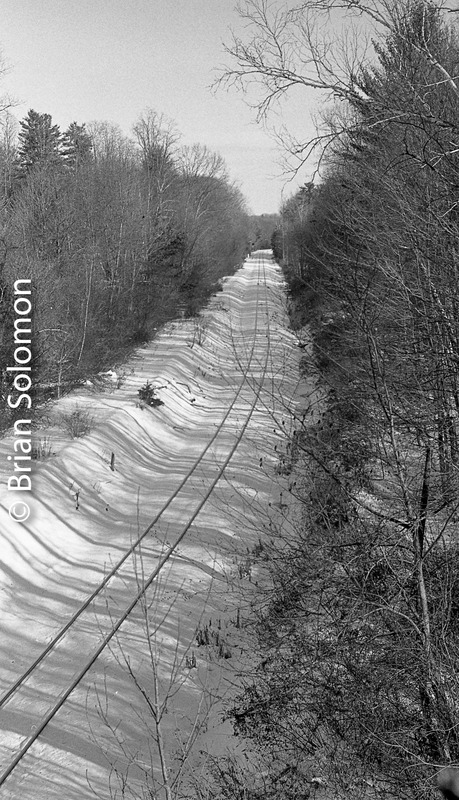 I found the traveling treacherous on Interstate 390 , but I was determined to made photos in the snow along the former Erie Railroad mainline. I arrived at Gang Mills as the storm was clearing to the east. The sun was just starting to poke out from behind the clouds and there was a fresh layer of snow over everything. I had three cameras with me that day, including my roommate’s Canon A1 that was loaded with a fresh roll of Kodachrome 64 (a gift from Kodak). Using my Leica, I exposed a few photos of eastward Conrail APL Stack Train TV-302 that was changing crews. Then plotted my course east. Conrail’s TV302 was changing crews at Gang Mills at 8:50 am on November 19, 1986. I had only a few minutes to figure out what to do and I’d never followed the old Erie Railroad east of Gang Mills before. Exposed on Kodachrome 64 slide film with my Leica 3A with 65mm Elmar f6.3 1/200th of a second. While I knew the line west toward Hornell through the Canisteo Valley, this was my first trip eastward along the former Erie toward Binghamton. I neither had good maps nor a scanner, but I had an eastbound train, fresh snow, sunlight and Kodachrome. (And the desire to make photos!). Over the next few years, I’d become very familiar with the old Erie mainline in this area, but rarely would I have conditions like this again. Another frame in the motor drive sequence. 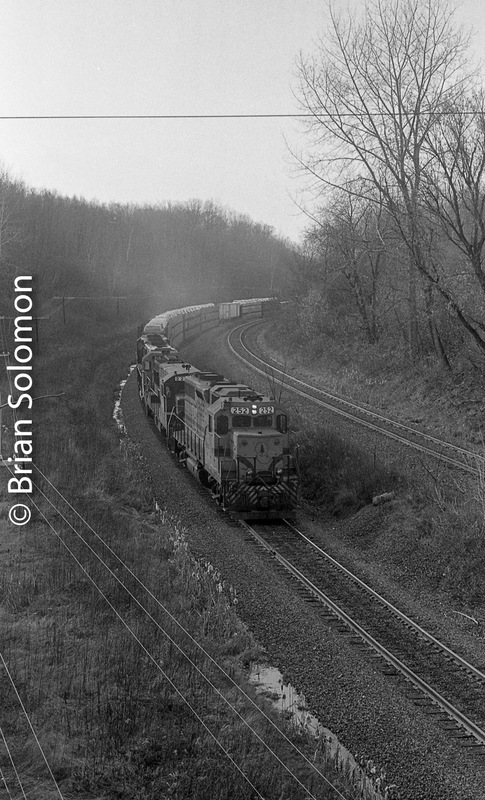 9:50am on November 19, 1986: In the spirit of the moment I made this trailing view at Chemung, New York. At the time I feared I was ‘wasting film’; today I’m glad I did! Canon A1 with 50mm lens exposed on Kodachrome 64 slide film. f9 at 1/250th of a second. An hour after I let TV-302 go, I found this westward Delaware & Hudson freight crawling along at restricted speed and about to stop. I learned later that snow had knocked some of the code lines down and the signals were displaying ‘stop and proceed’. This image was made east of Owego, New York at 10:53 am on November 19, 1986. Kodachrome 64 slide film, f4.5 1/250th sec. The westward D&H freight was soon on the roll again. There was a time when Boston & Maine GP40-2s seemed very common. Looking back, I didn’t make as many photos of them as I now wished I had, and I’m glad to have this 28 year old slide. In the afternoon, I returned to Gang Mills Yard (west of Corning, New York) where I caught a parade of freights. By then the snow had begun to melt. An eastward Delaware & Hudson BUAB was rolling through at 3:50pm. I made some black & white photos of this train with my Rolleiflex, but at that time-period I was experimenting with my processing for a class project, and I’ve never been satisfied with the resulting negative. Perhaps I’ll scan it and see what I can salvage digitally. This is a Kodachrome 64 color slide. Misty Morning on the Boston & Albany near Edwards Park, New York October 14, 2011. Fall Colors near State Line Tunnel. CSX L022 rolls west near Edwards Park, New York. Exposed at ISO 640 with a Canon EOS 7 with 28-135mm lens set at 53mm f5.6 at 1/200th second. To accentuate the autumn foliage, I manually set the white balance for a warmer setting rather than use the auto white balance that I find to be too cool for autumn trees. 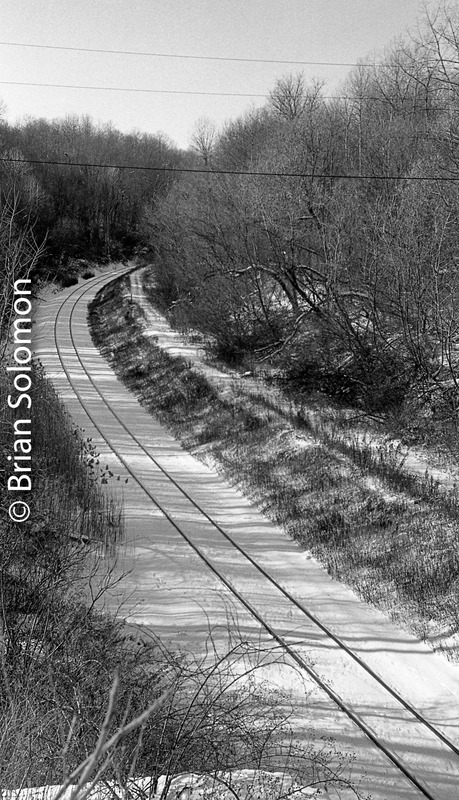 On the morning of October 14, 2011, I crossed the Berkshires on the Mass-Pike as I drove west to meet with accomplished railway photographer John Pickett. I had a few hours before our meeting, so despite low cloud and mist, I exited the highway at the Massachusetts-New York state line and drove toward Boston & Albany’s State Line Tunnel. While on Tunnel Hill Road in Canaan, New York, I noticed this colorful scene from the road side. As I got out of the car, I heard the unmistakable sound of a train roaring west. I had just enough time to get out my Canon EOS 7 and make a test image before the train passed. Another case of just being at the right place at the right time, and being ready to act. Zoar, Massachusetts, October 7, 2003. On This Day, Ten Years Ago. Canadian Pacific SD40-2s roar west on Guilford Rail System’s former Boston & Maine Fitchburg main line at Zoar, Massachusetts on October 7, 2003. It was a brilliant clear afternoon ten years ago, when Tim Doherty, Pat Yough and I followed Guilford Rail System’s EDMO (East Deerfield, Massachusetts to Mohawk Yard, Schenectady, New York) freight westward into the Berkshires of western Massachusetts. Rich blue skies, rusty foliage and a great sunlight make October a great time to photograph in New England. I exposed this image on Fujichrome using a Contax G2 rangefinder with 28mm Biogon lens. At the time Canadian Pacific Railway EMD SD40-2s were commonly assigned to this run, which made it a popular photographic choice.